Preferred class regular Rockin In Heaven served notice that he’s back and could be a force in 2019 with a punishing mile in his seasonal debut on Saturday (April 13) at Flamboro Downs. With regular pilot J Harris at the controls, Rockin In Heaven paced casually through panels of :29.1 and :59 before getting serious in the second half of his seven-year-old debut. Rockin In Heaven paced his back half in :55.2 over the Flamboro half-miler, hitting the third quarter in 1:27.1 before tacking on a :27.1 closer to trip the timer in 1:54.2. 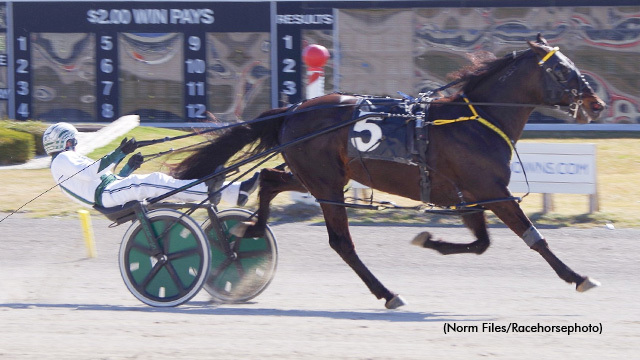 Teesha Symes trains Rockin In Heaven (Rock N Roll Heaven – Tropics Beachgirl) for Nova Scotia-based owners Douglas Polley and Gordon McComb. The stallion owns a 1:49.2 speed badge along with a bankroll in excess of $790,000. To view the charts from Saturday’s qualifiers at Flamboro Downs, click the following link: Saturday Qualifiers – Flamboro Downs.